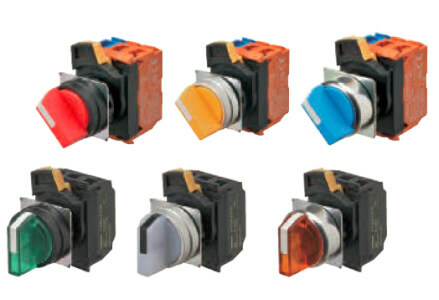 At the beginning of October, we will introduce several new products among Switching Mode Power Supplies, Safety Relay sockets, Pushbutton Switches, Power Monitors & Machine Automation Controllers, as the second wave of factory automation (FA) control devices built on a common design platform for unified product specifications. 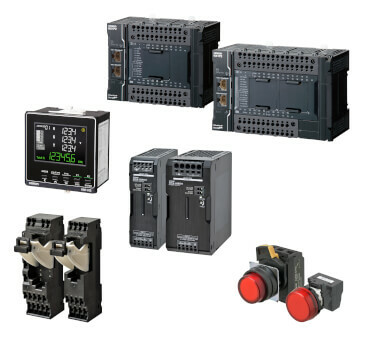 Based on a wide range of products, we have been continuing to work for the innovation of making control panels which house and control FA devices on the production front line. We unified the design and size of FA devices, and introduced products in April 2016 which are built with the company’s proprietary wiring technology “Push-In Plus technology” for device and control panel makers in need of "downsizing and space-saving" of FA devices and control panels, "expedited delivery," and "response to globalization." They have been adopted on the front line of manufacturing by more than 3,000 global companies and received a high evaluation. The expansion of the FA devices built on the unified design platform will have a great combined effect achieved by providing a wide variety of devices. We aim at innovating control panels of customers. Since the component height might vary depending on factors like power & heat dissipation, we have categorized in panel products in 3 main groups with their own specific placement (row) in a control panel; I/O, Control & Power. Within each category we have set the optimum rules to ensure that dead space is reduced and the width between wiring ducts is optimized. 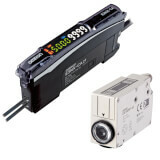 New S8VK-S (high-capacity models) are the first Omron products that join Power line category, more will come. 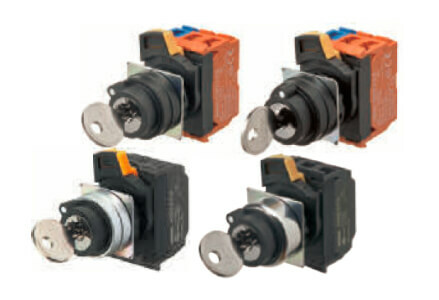 In particular, we applied the common platform to A22N-P/A30N-P Pushbutton Switches, M22N-P Indicators, and KM-N3 Power Monitors which are FA devices mounted on the front of control panels, P7SA-PU Sockets for Relays with Forcibly Guided Contacts for safety application and NX1P Machine Automation Controllers for motion control. Also, 240-/480-W models of S8VK-S world's smallest class of Switch Mode Power Supplies are made under the common platform as well. The S8VK-S Switch Mode Power Supply has a compact body with 50% less volume than previous products for 480-W models, made possible by using our unique technologies. 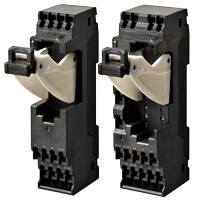 The S8VK-S high-capacity models allow side-by-side mounting in close contact on DIN rails to reduce the footprint, which helps downsize control panels. It also meets a broad scope of certification standards and ensures stable operation in a wide range of environments with greater environmental resistance such as a wide operating temperature range of -40 to 70 degree Celsius. * According to Omron survey in September 2016. Sockets for G7SA Relays with Forcibly Guided Contacts (P7SA-PU, 4 poles and 6 poles) joined Push-In Plus technology Relay Series introduced in April 2016. Featuring push-in mechanism on Sockets for Relays with Forcibly Guided Contacts unifies the wiring method of the whole control panels. 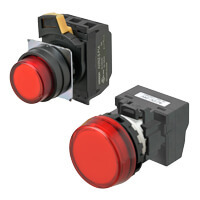 It also reduces wiring when used together with Safety Controllers which also have push-in terminals. Moreover, the 6-pole sockets are slimmer than the previous screw type sockets (industry’s slimmest design*) and control panels sizes can be kept to a minimum. Short bars are available for crossover wiring of contact terminals in the same socket. This helps further work reduction. * According to Omron survey in July 2016. Reinforced insulation between inputs and outputs/ Reinforced insulation between some poles of different polarity. 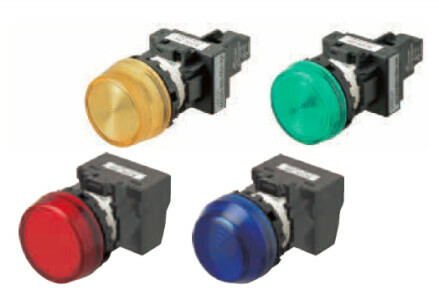 The A22N-P, A30N-P, and M22N-P are Pushbutton Switches and Indicators with mounting holes of 22mm dia. and 30mm dia., using Push-In Plus technology. Our proprietary technologies reduced the depth drastically and the volume by 20 to 30% in comparison with the previous models. Lighting Units were difficult to shorten its bodies, but the size of the Lighting Units is reduced in the same ways as the Contact Blocks. * For 4 to 6 contacts, the previous depth of 66.8 mm is reduced down to 55 mm. Push-In Plus technology combined with rear insertion eliminate the need for securing side space. It also saves space which was difficult with the contact blocks with screw terminals. This helps reduce workability and increase the freedom in design. Contact Blocks can be attached in any direction for easy assembly. 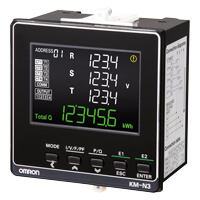 The KM-N3 is an on-panel installation type of KM-N2 Power Monitors, for in-panel installation. 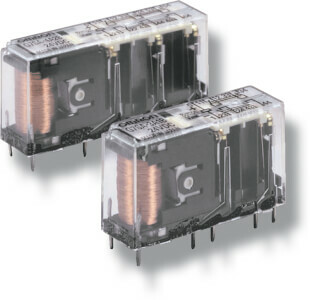 The use of general-purpose CTs (current transformers) enables the power monitor to be used at a variety of manufacturing sites as well as KM-N2. 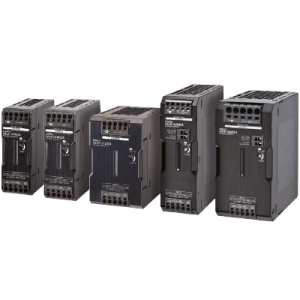 The wide-range design including single-phase to three-phase 4-wire power monitors is compatible with power supplies around the world, and provides measurements of up to four circuits in one unit. 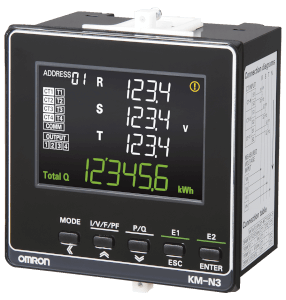 The power monitor also features precise measurements (IEC class 0.5S), reduction of installation work thanks to incorrect wiring detection and easy setting, and large, easy-to-read, white and green LCD characters, thus offering solutions from designing to start-up. * VTs are required in some regions. UL pending. 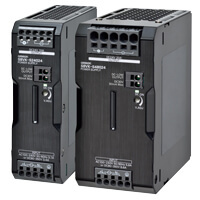 The NX1P is the Sysmac*1 entry level controller which integrates EtherNet/IP and EtherCAT connectivity, motion control, and I/O in a compact package, bringing advanced motion control and IoT to small-middle size machines. Electronic cam and interpolation increase machine speed and precision, which leads to improvement in productivity and quality. Data collected from devices via the built-in EtherCAT port and mounted IO-Link master unit can be shared between machines via the built-in EtherNet/IP port. This helps reduce machine downtime and increase productivity. Omron's integrated automation platform is dedicated to providing complete control and management of automation plant under one software. Programming based on global standards and global open networks allows for building the globally standardized system. 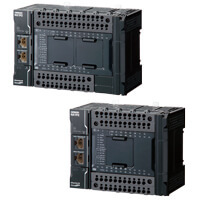 At the core of this platform, the machine controller series offers synchronous control of all machine devices and advanced functionality such as motion, robotics and database connectivity. This multidisciplinary concept allows you to simplify solution architecture, reduce programming and optimize productivity. EtherNet/IP™ is a trademark of ODVA.